Sean Morey’s blocked punt in the Cardinals 30-24 overtime win marked the first time in NFL regular season history that a game has ended on a TD off of a blocked punt. Yesterday’s OT win marked the first time since at least the 1970 NFL-AFL merger that a team has scored a touchdown on the first and last plays of the game (J.J. Arrington’s opening kickoff return and blocked punt in OT). Three overtime games in NFL history have ended on blocked field goal returns; the last was Philadelphia’s Clyde Simmons picking up his own team’s blocked field goal attempt and returning 15 yards for a TD @ NY Giants (11/20/88). The Eagles kicker who had his field goal blocked was Luis Zendejas, who is currently the Cardinals Senior Director of Community Relations. Backup linebacker Monty Beisel recovered the fumble and returned it three yards for the TD, the first TD of his career. For the Cardinals, it was the first blocked punt returned for a touchdown since Tommy Bennett recovered a Matt Turk punt (blocked by J.J. McClesky) in the endzone at Washington on 9/14/97. It represents Sean Morey’s second blocked punt as a member of the Cardinals—the other was vs. Seattle on (9/16/07). The Cardinals are now 2-1 in overtime games at University of Phoenix Stadium and have won two in a row. It marks the first time the Cardinals have won in overtime when they lost the coin toss since a 2002 9-6 OT win vs. Dallas on 10/20/02. The touchdown in overtime yesterday was the Cardinals second overtime touchdown in franchise history, with both coming on returns. There was Monty Beisel’s 3-yard return on the blocked punt yesterday and on 10/29/95 vs. Seattle, Lorenzo Lynch returned an interception 72 yards for a touchdown in a 20-14 win. It was the first blocked punt of Mat McBriar’s career. ·With a 4-2 record heading into their bye week, the Cardinals now hold a two-game lead in the NFC West after losses by San Francisco and Seattle this week. The Cardinals four wins match the combined win total of the other three teams in the NFC West. ·No NFC team has more wins than Arizona’s four. In the entire NFL, only Tennessee (5-0) has more victories. ·This season marks the second time since the implementation of the bye week in 1990 that the Cardinals have had a winning record heading into their week off (3-2 in 2002). ·The win over the Cowboys gives the Cardinals a 9-2 record in their last 11 home games under head coach Ken Whisenhunt. 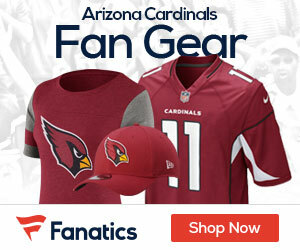 ·Yesterday’s game was the Cardinals 25th consecutive sellout at University of Phoenix Stadium. ·The win gives the Cardinals a six-game home win streak, their longest since 1975-76 when they won the final home game of the 1975 season and the first five home games of the 1976 season. The Cardinals have also won their first three home games for the first time since 1976. ·The win marks the first victory over the Cowboys since 10/20/02, a 9-6 overtime victory playing host to the Cowboys at Sun Devil Stadium. ·With 30 points yesterday vs. Dallas, the Cardinals now have 30+ points in nine of the last 14 games and 20+ points in 13 of the last 14 games. Yesterday’s win was the fifth straight home game where the Cardinals have scored at least 30 points and it was the eighth straight with at least 20 points scored. ·Arizona’s 177 points scored are the most in the NFC and second in the NFL, just behind San Diego’s 178 points scored. ·The Cardinals collected three sacks of Dallas QB Tony Romo in the victory, giving them at least one sack in 29 consecutive games, the longest active streak in the NFL. The Cowboys have the second-longest streak (23 games). Of the Cards 29 consecutive games with a sack, they have collected at least two in the last eight straight games. ·Entering yesterday’s game, Romo had been sacked just four times in the first five games of the season with three separate occasions where we was not sacked once. ·The Cardinals held the Cowboys (who entered the game averaging 138.8 rushing yards per game) to just 73 net yards rushing yesterday. The Cardinals have now gone 11 consecutive games without a 100-yard rusher. The last RB to rush for 100 yards on the Cardinals was San Francisco’s Frank Gore, who rushed for 116 yards on 11/25/07. ·Arizona scored 14 points inside the redzone yesterday giving them 138 points in the redzone so far this season, the highest total in the NFL. ·J.J. Arrington’s 93-yard kickoff return for a TD to start the game was the first kickoff return for the Cardinals since Arrington’s 99-yard kickoff return to start the game @ Minnesota on 11/26/06. It is the sixth game-opening kickoff return for a TD in franchise history. ·Arrington joins Gale Sayers, Mercury Morris, Ike Thomas and Steve Odom as the only NFL players since 1964 with two opening kickoff TDs in their career. ·Antonio Smith’s first quarter fumble recovery of a Tony Romo fumble was his third of the season, tying a career-high, set in 2007. ·With his 2-yard TD reception in the third quarter, Larry Fitzgerald reached 39 receiving TDs for his career, moving into sole possession of fifth-place on the Cardinals career TD receptions list. ·Kurt Warner completed 22-of-30 passes for 236 yards, two TDs and a 104.3 QB rating in the win over Dallas. It marks the fourth game this season with a completion percentage over 70.0 percent and the third in a row. Warner has completed 149-of-213 passes (69.99%) on the season. ·Yesterday’s game was Warner’s third of the season with a passer rating of 100.0+ and second straight. He now has 11 games with a passer rating of 100.0 or better (min. 15 attempts) as a member of the Cardinals and has an 8-3 record in those games, winning the last four. ·Warner now has a 33-3 record when he has a QB rating of 100.0+. ·With his 2-yard TD pass in the third quarter, Warner made it 14 consecutive games with at least one TD pass, tying Neil Lomax for the third longest streak in franchise history. ·Warner’s 11-yard TD pass to Breaston in the fourth quarter gave him multiple TD passes in five consecutive games and in 13 of his last 14 games. ·Steve Breaston’s 11-yard TD reception from Kurt Warner in the fourth quarter was the first receiving TD of his career. ·Breaston caught eight passes for 102 yards and a touchdown in the victory, his second 100-yard receiving game in the last three games. He now has 24 receptions for 301 yards and a TD in his last three contests. ·Over the last three games, Breaston is tied with Atlanta WR Roddy White for first place in the NFL with 24 receptions. His 301 receiving yards are the fifth-highest total in the NFL over that span. ·The Cardinals sacked Dallas QB Tony Romo three times in yesterday’s games, giving them 18 sacks through the first six games of the season. ·The Cardinals defensive linemen have combined for 12 sacks through the first six games (Berry-4, LaBoy-4, Dockett-2, Watson-1, Robinson-1) and also have 13 QB hits and five fumble recoveries. ·Antonio Smith’s first quarter fumble recovery of a Tony Romo fumble was his third of the season, tying a career-high, set in 2007. His three fumble recoveries lead all NFL defenders this season. ·Darnell Dockett appeared frequently in the Dallas backfield yesterday, collecting his second sack of the season and adding a tackle-for-loss and three QB hits. ·Both Bertrand Berry and Chike Okeafor had a sack and a forced fumble in yesterday’s win. Berry now has a sack in all four games he has played in this season while Okeafor has three sacks on the season. After a bye week this week, the Cardinals will travel to take on the Carolina Panthers on October 26th.